A 2232-page US spending bill unveiled this week contains good news for horses, with no language that would allow the reopening of abattoirs on American soil and no provisions that would permit wild horses to be sold for slaughter. The massive bill, if passed by Congress, will keep the government running until September 30. However, it must be passed in the next few hours to avoid a further government shutdown. Last-minute changes in relation to such matters in such a massive omnibus bill are highly unlikely. The issue of horse slaughter plants re-opening on US soil is regularly debated at committee level ahead of spending bills, centering on whether federal funding is granted to allow for the mandatory inspections required at horse slaughter plants. If no federal funding is permitted, the plants cannot open and operate. The debate around the fate of wild horses, including the many thousands being held in captivity, arose in recent months, when the Bureau of Land Management (BLM), the agency responsible for wild horses and burros, sought the right to be able to sell the animals without limitation. 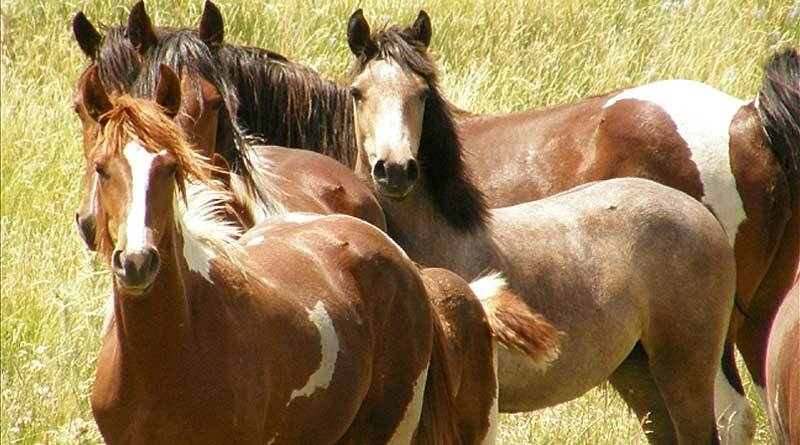 Wild horse advocates objected to the proposal, fearing it would see wild horses sold into the slaughter pipeline. The language in the current bill sees both threats recede. The Humane Society of the United States says it has been through the bill to identify provisions that affect animals. The president of the Humane Society Legislative Fund, Michael Markarian, notes that the bill includes language that prohibits government spending on horse slaughter inspections, effectively banning horse slaughter in the US for human consumption. “This language has been maintained all but one year since 2005, and ensures that millions of taxpayer dollars are not expended on resuming an inhumane and predatory practice in which young and healthy horses are rounded up by ‘kill buyers’ — often misrepresenting their intentions — and their meat shipped to Europe and Japan,” he writes in his blog, Animals & Politics. The bill includes language to prevent the BLM and its contractors from sending wild horses to be slaughtered for human consumption, or from killing excess healthy horses and burros. “A provision allowing wild horses removed from public lands to be transferred to federal, state, or local governments to serve as work horses continues to make clear that these horses cannot be destroyed for human consumption, or euthanized except upon the recommendation of a licensed veterinarian in cases of severe injury, illness, or advanced age,” he says. The bill also includes a $US1 million increase for the Adaptive Sports Program that awards small grants for equine therapy, to expand this program that has focused in the past on helping veterans with physical disabilities to now include mental health issues, including post-traumatic stress disorder. Markarian says there are some “anti-animal” provisions in the bill, such as exempting concentrated animal feeding operations from reporting toxic air emissions, and restating previously enacted riders such as the prohibition on regulating toxic lead content in ammunition and fishing tackle which poisons wildlife. “But overall, this omnibus has a lot to cheer about for animals. Michael Markarian’s blog can be read here.